Looking for interdisciplinary classes that think outside the box? Want to go beyond theory and understand how academic concepts apply in real-world settings? Take a class with the Allbritton Center for the Study of Public Life! or Service-Learning! You can see all CSPL courses here, and you can check out all Service Learning courses for Fall 2019 here. This is an intro-level crash course in social entrepreneurship. We will start by defining social entrepreneurship, then we will explore the tactics and tendencies of successful social entrepreneurs. We will partially incubate a real social enterprise, learning by doing. Each session will be a combination of lecture, group work/discussion, and in-class presentations. 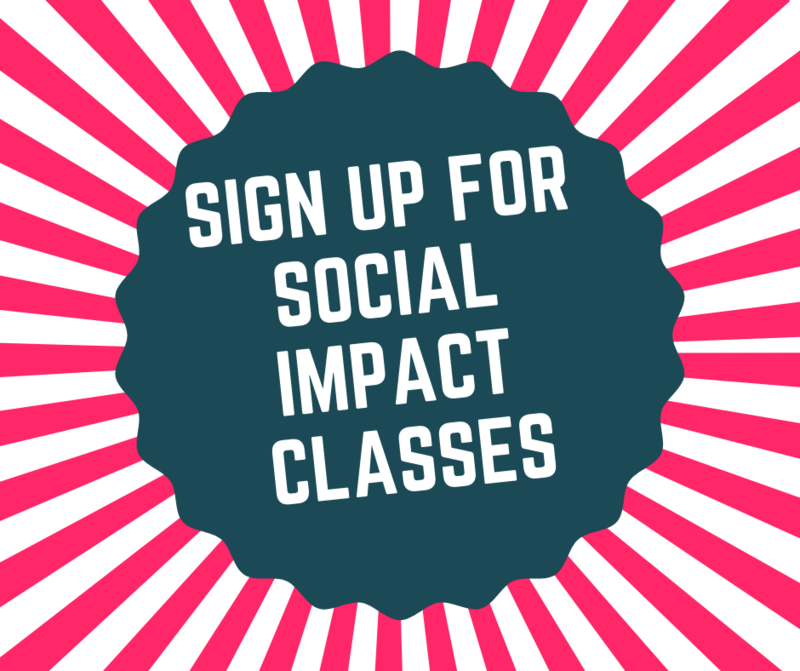 This course will be useful for students who want to think critically about how social change happens, launch their own projects or ventures, innovate solutions to social and environmental problems, hone their activism, and/or build practical skills. Although it is introductory level, it will be useful for students already involved with social impact organizations or entrepreneurial enterprises. The Nonprofit Board Residency program is a .5 credit course that provides an opportunity for Wesleyan students to learn about the nonprofit sector and work closely with a local nonprofit board of directors. Students will attend board meetings and actively participate in a committee of the board while completing a project identified by the organization. Students will also meet weekly on campus with the instructor, Clifton Watson, director of the Jewett Center for Community Partnerships, for readings and discussions about the nonprofit sector, boards of directors, reflections on the experience and more. This course is POI and students must be willing to commit to the entire year. The core animating principles and practices of human rights are under threat. Will the global human rights movement be able to respond effectively? How could or should the movement advance the cause of global social justice most effectively? This seminar seeks to answer these questions by assessing global rights defense and social justice practice and by engaging in structured, self-critical human rights advocacy. Among the issues considered in this seminar will be the following: What are the origins of the human rights movement? Has the movement been dominated by ideas from the West and elite organizations from the Global North? What does it mean to be a human rights activist? What is the role of documentation, legal advocacy, and social media in human rights advocacy? What are the main challenges and dilemmas facing those engaged in rights promotion and defense? Students will be required to write several short reflection papers. The final project will be an exercise in developing a human rights advocacy project or supervised engagement in actual human rights advocacy in conjunction with the University Network for Human Rights (humanrightsnetwork.org). This course will examine current controversies in U.S. and world politics with a focus on the options facing U.S. policy makers at the present juncture. We will explore the insights that social science can bring to topics such as: immigration policy, the refugee crisis in Europe, human rights and U.S. foreign policy, the federal deficit, Medicare for all, etc. Most weeks there will be a public lunch talk by a visiting speaker at noon on Thursdays, after which the speaker will hold a discussion with the class members. Through both theoretical analysis and practical application, students will explore how, in a collaborative community setting, performance and art-making come into relationship with the local environment, history, and communities. This hybrid course includes readings, seminar discussion, project-based learning, and community engaged research and practice. We will gain an overview of artists who engage directly with communities, places and environments, and explore new means of civic participation. The class will work on a collaborative project based in Middletown area and history. For final projects, students will develop short, creative projects in collaboration with a site of their choosing. This seminar is intended to help students develop the skills to learn from experience in educational settings, through rigorous reflection, analysis, scholarly inquiry into educational questions, and action/implementation of new ideas. It is designed for students with previous coursework in education, experience in educational settings, or both. Students will be placed in a variety of educational settings in the community and each student will craft an independent study, with ongoing guidance from the professor and from the group, related to their placement. Class sessions will be seminar-style with students sharing and workshopping their studies and their practice. There will be group readings on aspects of education studies including reflective practice, classroom ethnography/teacher research, and observational techniques, but students will also develop individualized reading lists according to the focus of their independent study. In addition to ongoing written work in the form of analytic journals and critical reading synopses, students will complete an individualized final paper or project integrating their research and experience over the semester, and give a final presentation. Geographical information systems (GIS) are powerful tools for organizing, analyzing, and displaying spatial data. GIS has applications in a wide variety of fields including the natural sciences, public policy, business, and the humanities–literally any field that uses spatially distributed information. In this course we will explore the fundamentals of GIS with an emphasis on practical application of GIS to problems from a range of disciplines. The course will cover the basic theory of GIS, data collection and input, data management, spatial analysis, visualization, and map preparation. Coursework will include lecture, discussion, and hands-on activities. Recent years have seen the on-going tragic refugee crisis, with millions of people being displaced because of war and ecological disasters. That this crisis also has religious overtones is evident by the so-called travel ban in the United States or the rhetoric used by right wing leaders across Europe. This course deals with the meaning of refuge, exile, and diaspora through three perspectives: philosophical, historical, and literary. A variety of case studies–including the contemporary refugee crises in the Middle East, the black transatlantic, and the destruction of the temple in the Hebrew Bible–will raise for us various questions: What does it mean to be violently forced to leave one’s home? How is it possible to make sense of such a tragedy? What creative power can diaspora muster to the rescue of culture? This course is a Service Learning course in cooperation with WESU 88.1 FM Middletown. Each student’s final project will be a radio show based on an analysis of a selected refugee crisis. Our focus will be on understanding the role of social factors (e.g., income, work environment, social cohesion, food, transportation systems) in determining the health risks of individuals; considering the efficacy, appropriateness, and ethical ramifications of various public health interventions; and learning about the contemporary community health center model of care in response to the needs of vulnerable populations. We explore the concept and history of social medicine, the importance of vocabulary and the complexity of any categorization of persons in discussions of health and illness, ethical issues related to the generation and utilization of community-based research, the role of place and the importance of administrative and cultural boundaries in the variability of health risk, and the idea of just health care. Enrolled students serve as research assistants to preceptors at the Community Health Center (CHC) of Middletown.